Originally from Boston - Lincolnshire, the multi-instrumentalist moved to Atlanta in the US during the summer of 2010 to record her debut album with Grammy nominated US artist Shawn Mullins. Today, Callaghan has made Nashville her fulltime base, and she is working hard to establish herself as a valid contributor to the Nashville singer-songwriter scene, her efforts appear to be paying off as she has independently sold more than 10,000 albums, toured with artists such as Shawn Mullins, Griffin House, Ed Kowalczyk, and Jake Shimabukuro, and she’s even done a showcase at SXSW. Country music is a well-established genre in the USA, and thanks to people like Bob ‘Whispering’ Harris, it is gathering momentum on this side of the Atlantic too. There does seem to be a new wave of support for Country music, she says. Partly to do with people like Bob Harris and his country show, and BBC introducing is helping to establish Country artists. It is a lot different to here in Nashville, there is so much music coming out of here and not all is strictly Country music although most will borrow influences from the genre. Country music has changed, today it’s not strictly Dolly Parton or Johnny Cash - genres are blending together, and that’s attractive to a broader group of people. Country music is still largely misunderstood in the UK, we have people like Keith Irving and Taylor Swift that are considered Country but really compared to the original Country artists they’re miles away. There’s so much pop and rock blended into Country it has long since lost its rigidity. Callaghan describes her music as singer songwriter pop music with country and folk influences and admits it’s not always easy staying true to the genre. If you want to go down the traditional Country route there are definite subject matters that they talk about which are very different from my music because they are things that I have no experience of, like growing up on a farm or things to do with American culture, tailgating for example (a social event held on and around the open tailgate of a vehicle. Tailgating, which originated in the United States, often involves consuming alcoholic beverages and grilling food). I was classically trained to begin with - on the flute, and studied all the music theory and such like when I was young. I got into song writing when I was 14 and then wanted to learn something else, that’s when I got into piano. I’ve tried to have piano and guitar lessons but I couldn’t – I hated it. I just wanted to sing songs and play songs I liked, so I taught myself piano using the Elton John song books. I knew all the songs so learning the music was easy. I love performing, and I’m addicted to wearing leather on stage, I wear leather trousers a lot, I love ‘em. Piano or Guitar do you have a preference? The Piano is probably my first choice instrument because I’ve played that for longer. But they give different things, the piano is so mellow, I can really get in the zone live and when I’m writing and then the guitar gives you the freedom to move when you’re performing. I read an interesting article last week entitled ‘Move over Jonny Cash, Study Reveals Ed Sheeran is the Modern Romantic Wordsmith’. It’s been put together in an effort to better understand attitudes towards modern day romantic writing. Developed in conjunction with Julia Bird of the Poetry Society, she has spent 5 weeks analysing the top 10 most romantic poems for common traits, with the perfect verse essentials emerging as (P) pattern, (B) brevity, (C) comparison, (O) obstacle and (X) mystery quality. I’m not saying the secret to crafting the perfect verse could be as simple as: X (p + b + c + o) But I think they’re onto something here…. For Callaghan it starts with consciousness and then just add sincerity. That’s the beauty with song writing, you decide as the writer - what you think about the subject matter, that’s what you’re sharing with someone else. People recognise when it’s come from the heart. The best thing you do when you’re writing is make sure it’s sincere. It is hard to say what you want too without over thinking it and it sounded unnatural, some people worry about whether it rhymes, and if it fits in the spaces. I feel like the important thing is to write something that truly feels like it’s come from you, regardless of whether it rhymes or if there are some odd words scattered around that don’t really fit. Sometimes if I’m struggling I’ll write a load of lyrics down relating to the subject, I write words that I might never use, that mind not look nice, words I might not like, this help me obtain a consciousness about how you really feel about the subject. 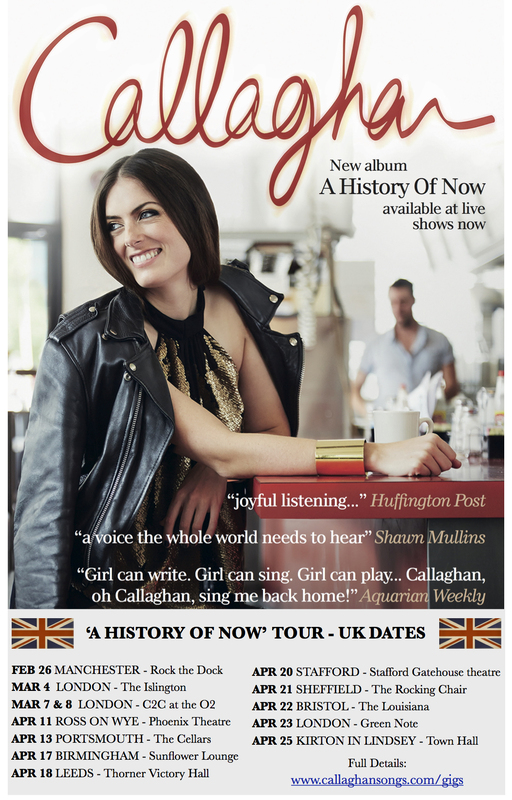 Following on from successful UK tour dates in October 2014, Callaghan will be back on UK shores for live dates in 2015, including a special performance for the BBC at Rock the Dock, Media City next Tuesday (Feb 26th). She tells me she knows the city quite well. My older sister went to Manchester University, she’s 6 years older than me, and I used to go to visit her for fun weekends out. I didn’t go to university, I got the University experience through my 2 older sisters without having to eat beans from a tin or do any of the course work. Her second album ‘A History of Now’ scheduled for full release in late spring. 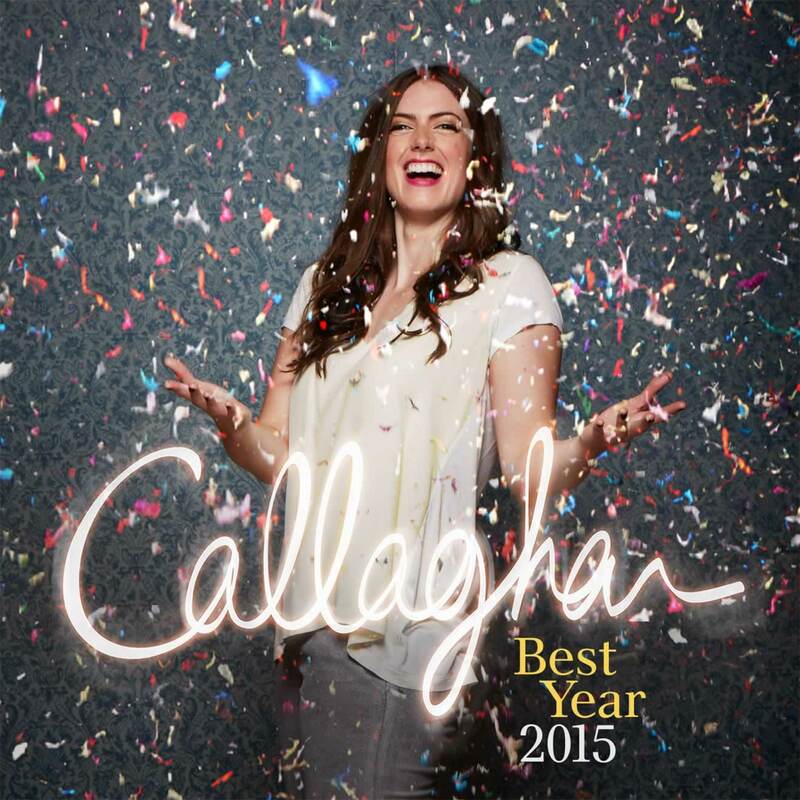 The first single, ‘Best Year’ is out February 15. Head over to the website now to download a free 5 track taster. Highlights include opener ‘Crazy Beautiful Life’, which celebrates the unpredictability and exuberance of life and ‘Who Would I Be,’ a tribute to Callaghan’s supporters, thanking them for enabling her to do what she loves. ‘Noah’s Song’ is one of the album’s most personal songs, written about Callaghan’s nephew, and includes guest backing vocals from a 9-year old fan, whose grandfather donated to the album’s Pledge Campaign.